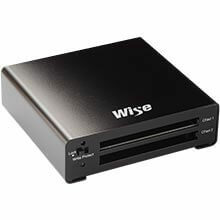 Wise card readers offer ultra-versatile solutions for the world’s leading recording media. 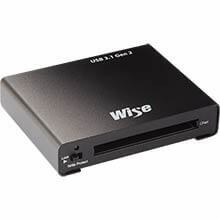 It combines USB-C industry standard with USB 3.1 Gen2 interface, delivering speeds of up to 10 Gb/s for twice the bandwidth of a USB 3.0 interface. With its unique write protect system and sleek aluminum casing, your valuable footage is protected in style. Built to handle high-end media, Wise is committed to manufacture compact card readers to transfer your hard-earned footage fast and safe. With a blazing-fast 10 Gbps read speed, you are able to transfer RAW images, high-res photos, and HD, 3D, and 4K video with ease. Wise card readers support general CFast™ 2.0 & SD™ cards to leading branded proprietary recording media. 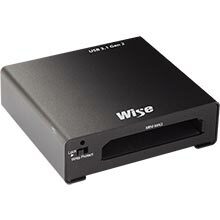 With our proprietary write protect switch design, filmmakers can avoid the risk of losing their precious footage. The sleek aluminum design is not only solid, but also protects the drive from overheating.